Roguelike games — where you traverse through randomly-generated rooms and start over after each death — are a dime a dozen on Nintendo Switch. 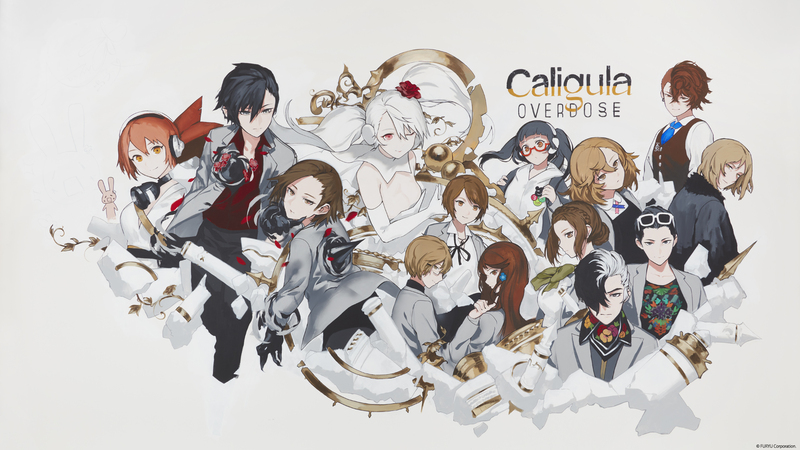 There’s a roguelike game for just about every sub-genre, it seems; even one that’s also a rhythm game! With such a crowded field to contend in, it’s hard for new roguelike titles to really stand out on the platform. And that’s what’s kind of funny about how City of Brass caught my attention. It’s developed by “senior BioShock developers” — OK, cool. It has an Arabian Nights theme where you run around with a whip and sword — OK, pretty sweet. There are genies and undead swordsmen and spellcasters that laugh maniacally. I’m into it. Much like how Moonlighter hides its fairly by-the-numbers roguelike mechanics behind a pretty aesthetic, City of Brass initially appears to be a grandiose adventure about looting an undead city of its riches, when it’s really just another repetitive randomly-generated slash-a-thon. 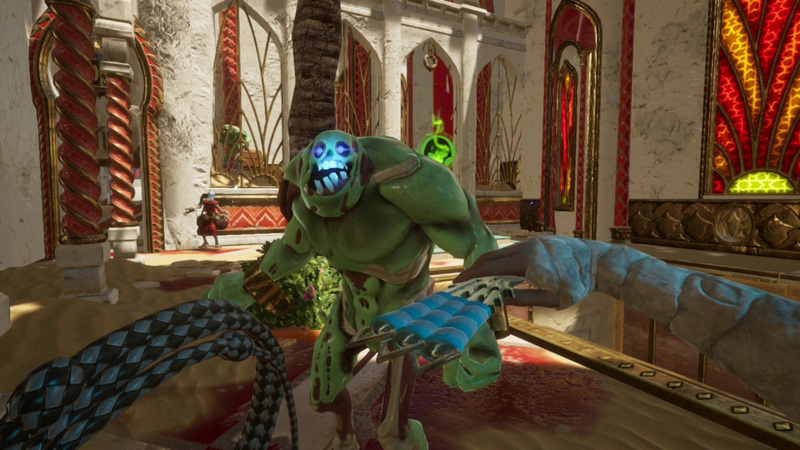 Unfortunately for City of Brass, all of that hacking and slashing isn’t even relatively fun. 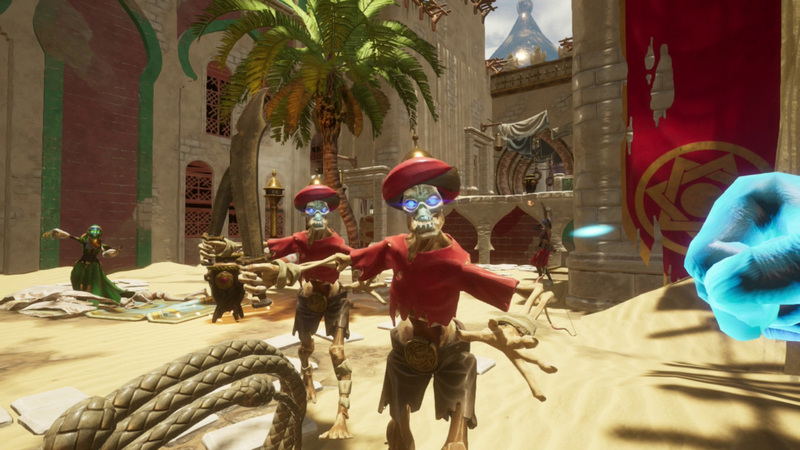 City of Brass stands out because of its 3D, first-person perspective. 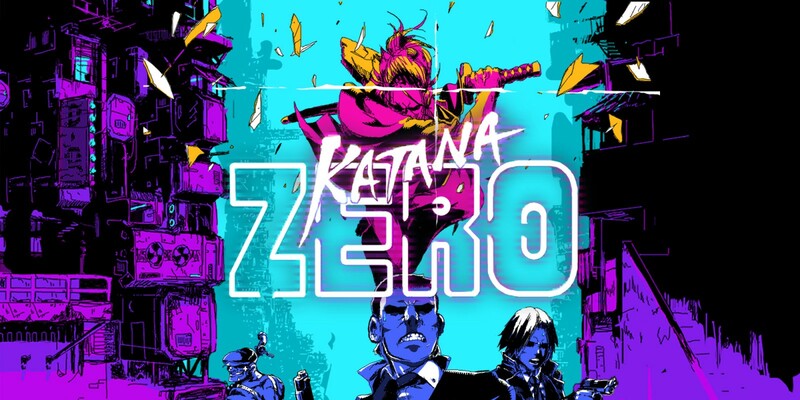 Your character (of which there are a couple to choose from and unlock) carries a melee weapon and a whip, each controlled with the trigger buttons. The whip can be used to whack enemies from a distance and momentarily stun then, giving you enough time to stroll over and slash at them with your sword or poke them with your spear. There are a handful of enemy types — skeletons with and without swords, skeletons with armor, zombie-looking creatures, spellcasters, and so on — that take more slashes from your sword to kill as you get deeper and deeper into the city. You’ll move from indoor rooms to outdoor spaces to indoor rooms as you meander through each level, coming across one-on-one enemy encounters and huge groups — pretty basic roguelike stuff. 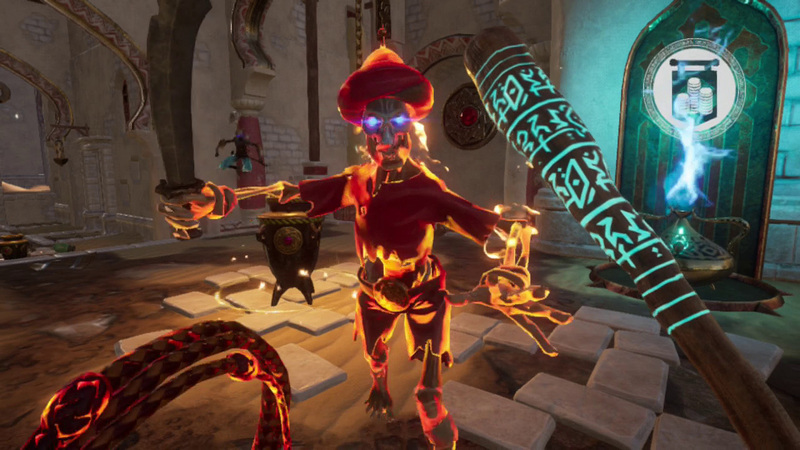 Given that City of Brass comes from developers with BioShock pedigree, you’re probably thinking you can use the whip to swing across rooms and slam your sword down onto an enemy’s head — or whatever else that would look and feel really, really cool. But, no, you simply walk up to an enemy — or strafe around them — and swing your sword very slowly. It’s like Skyrim‘s first-person combat without spellcasting and also in slow-motion. It’s tedious and agonizing. Enemies will often run into you while your attack animation is “loading up.” That’s how slow it is. There could be a decent game here if the combat had a lot more “umpf” in it. City of Brass does put a couple of little spins on roguelike tropes. 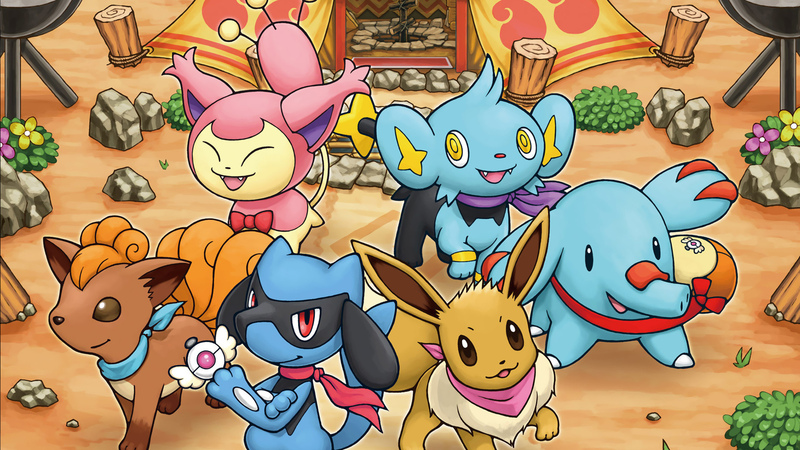 The main objective of the game is to get through 12 randomly-generated levels and then defeat a final boss, all while collecting as much treasure as possible. This treasure then converts into gold that you can use to buy power-ups from blue genies that are scattered throughout each level, although their usefulness varies; the most useful upgrade I found did damage to enemies whenever they did damage to me. You can also upgrade your weapon’s strength at the cost of lowering its attack speed even further, if you’re a masochist. Each level is also littered with different traps, from pits of spikes to falling doors to stairs that turn into ramps, sending you sliding back toward the horde of enemies that you’re too slow to defeat. The traps are either a minor annoyance or a hair-pulling frustration, depending on how easy or hard you decide to make City of Brass. Before each run, you’re able to change some settings to give yourself more life, do more damage, limit traps, etc. You can even make the game harder. By default, you’ll begin with little health and a timer to complete each level, which is what makes the traps and tedious enemy encounters even worse. The only reason why City of Brass is “hard” is because, again, the combat is just so damn slow. You have three or four enemies running at you — maybe you can stun one with your whip and slash at the others, but they’re gonna get their licks in on you while that sword is getting ready to swing. For those curious about replay-ability, City of Brass does make starting a new run a little less daunting. There’s a mini-boss every three levels, and players can jump into the following level on each new run if they’ve managed to get past the mini-boss; the catch is that you’ll be entering these later areas without a bunch of upgrades. I was able to beat the game in about five hours. I don’t want to disparage the developers too much because making a game is hard stuff — something I will never be able to do in my life — but something has to be said about opting for random level generation over hand-crafted design. Being in first-person allows for some cool environmental puzzles and exploration that requires players to take note of their surroundings in ways that 2D games don’t. City of Brass does neither of those things, sadly. It even has an arrow at the top of the screen to constantly tell players which direction each level’s exit is. Unfortunately, that arrow never pointed toward my Switch’s power button. Disclaimer: A review code for City of Brass was provided by Stride-PR. 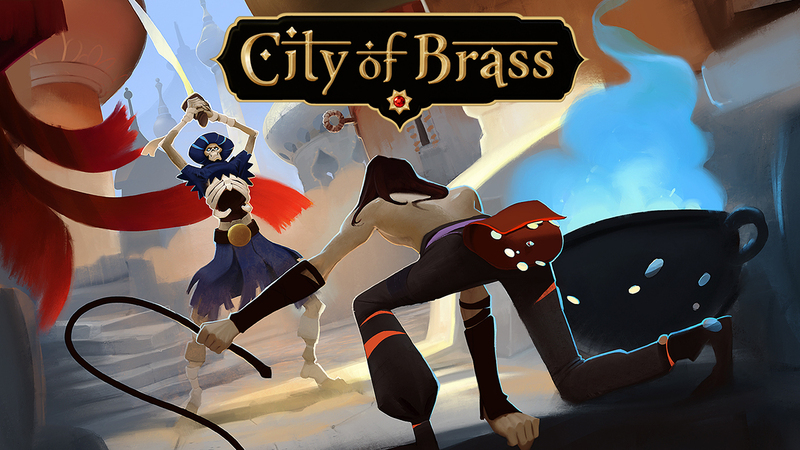 There's such a cool concept with City of Brass that just never came to life because the developers constrained themselves to the roguelike genre. That would be OK if the game was at least competent in the direction City of Brass went. 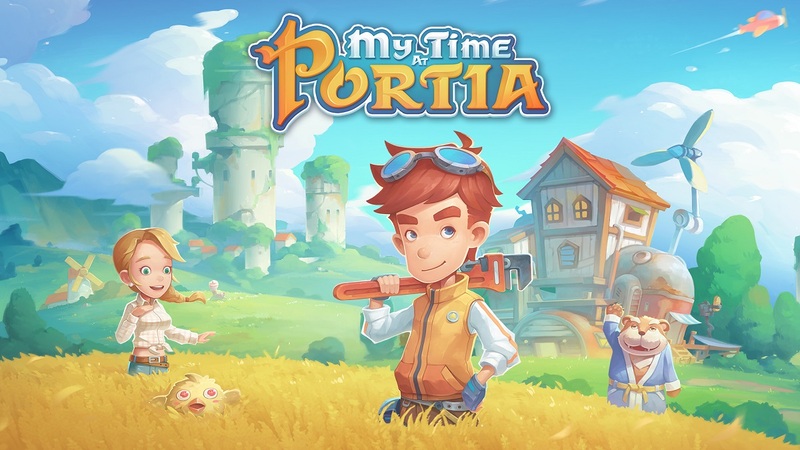 This is such a slow and tedious game that it's hard to recommend to anyone except those that truly enjoy misery. If you're looking for a good roguelike, check out Dead Cells instead.